I remember a scene from The Wizard of Oz, when Dorothy stood at the precipice of the haunted woods reading a sign that read, "I'd turn back if I were you." Dorothy wasn't smart enough to heed the warning, and neither am I.
I was invited to join a press junket hosted by Oakley, a former supporter of USA Hockey Magazine, and thought it would be a good idea to go and see if their future advertising plans included reaching potential customers through the pages of the world's largest hockey magazine. (Insert shameless plug, here.) Little did I know that I would be embarking on an odyssey that would take me to the top of a fog-shrouded mountain in Northern Vancouver and smack-dab into the middle of a scene so bizarre that it would win a gold medal for absurdity. 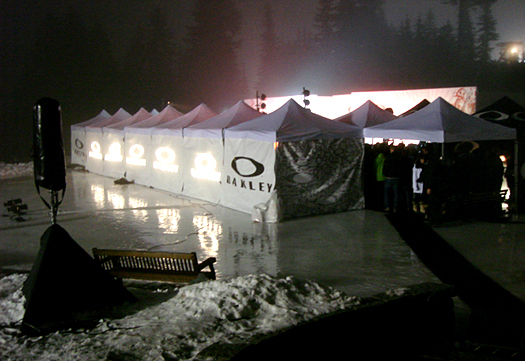 The Oakley Tents provided an oasis of marketing in the midst of the Canadian mountain. The instructions were pretty clear, take the Seabus (Vancouver's version of a ferry) across to Lonsdale Quay, board a van and head up to Grouse Mountain, where the Today Show is broadcasting during the Olympics. When a suspicious package shut down the Seabus, that was my Dorothy moment to turn around and retreat to the creature comforts of the main press center (I mean centre). Against my better judgment, I stuck it out and was loaded into a rental van along with a group of Chinese journalists and off we went. I'm in the process of compiling a list to send to Steve Jobs of Apple on why the iPod is the greatest invention ever made, and added another entry when our van driver didn't get the correlation between the dinging bell and his unbuckled his seatbelt. We finally arrived and were whisked inside a tram for a 10-minute ride up the mountain. On a clear day I can only imagine that the view would be amazing. But today I knew what it feels like to be packed inside an aspirin bottle surrounded by cotton balls. If the best way to a man's heart is through his stomach, then the best way to reach a journalist is through his liver. Oakley knows this and had plenty of free wine and beer waiting for us, which was needed to sit through the presentation of various products. Seriously, Oakley does make great products, but sitting and listening to two PR flaks little skit was a little over the top. "So John, how does it work?" "Well I'll tell you Russ. It's really quite amazing." "It really is John. I've never seen anything like it." Seriously? You guys have crisscrossed the country doing this schtick several times a day for liquored-up dopes and now you're acting like this is new. It's like "Wow Abbott, I had no idea that Who's on First." Anyway, you have to admire their passion for the products. Again, they do make really good stuff, including hockey visors. But to ask anybody a specific question about them, you have to talk to the vice president of hockey visors, who wasn't available at that moment. Of course not. Shawn White shows off his fashion sense.More free beer was the carrot used to get me inside a press conference with several Canadian skiers talking about how much they love their googles but not enough to keep me there. I wandered over to the observation deck to stare out into the foggy night and ponder my escape from Witch, I mean Grouse Mountain. That's when the doors popped open and in walked Shawn White and his entourage. I was just watching him doing flips and spins on 60 Minutes and here he was, laughing and joking three feet from me. They were up there to take part in a fashion show that would begin in five minutes. It was all starting to make sense. The beer, the umbrellas, the hot chocolate and s'mores at the front door. They really wanted us to trudge across the soggy snow and into a tent to watch a flippin' fashion show. In the rain, no less. As White and the other skiers walked a makeshift stage showing off the latest high fashion eye wear, the lights near their feet gave off an eerie glow as they sat steaming in pools of rain water. I could already picture the headlines in today's Vancouver Sun. "Flying Tomato Fried At Fashion Show." Morbid curiosity wasn't enough to keep me standing under a tent packed shoulder to shoulder with other journalists sipping hot chocolate. It was time to board the tram for the long ride into the dark, foggy abyss. We finally reached the bottom of the mountain and I found my shuttle driver in the parking lot. We quickly loaded the van for the long ride back into downtown Vancouver, with the seatbelt bell dinging the whole way home.